More economic-illiterate political commentary was released today from the Detroit Free Press, a publication notorious for shortsighted commentary on current events. Their recent article, entitled Keep job creation top state priority, refreshes the economic air with a splash of more politically-convenient potpourri, covering the lamentable stench of economic decay in the city which once stood as the Arsenal of Democracy, the bastion of productivity, and the economic envy of the world. The article begins by claiming, "The state still needs more good-paying jobs, and it should also diversify its portfolio of industries." Now, jobs are the means to the desired ends of productive and useful goods. Theoretically, jobs and their creation are nothing more than an organic byproduct of necessity, that is until they are rendered superfluous by still further advancements in automation which may relatively inexpensively, reliably and indefatigably produce the same or better output than the human counterpart. Of course, hiring human beings is expensive and risky. There are legal liabilities associated with every individual interviewed, hired and fired. The employer is also responsible for wages and salaries, but also the costs of recruiting, training and benefits which, in tandem with payroll taxes, yield a hefty price tag not readily apparent to the employee or the unwitting author facing a deadline. And yet there is some truth to the notion that Detroit might long benefit from more good-paying jobs and a diversification of industry. However, the means to these ends will reveal the character and sustainability of these efforts. For, it is not by mere decree that people are made more affluent, but by the enhancement of their total productivity which drives down costs and merits universal increases in the real wages and salaries across the market. 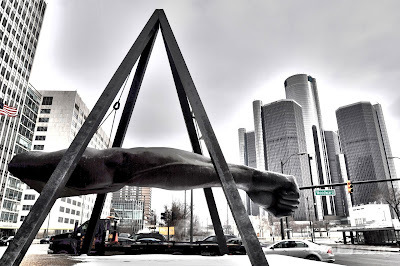 It is true that Detroit has long pranced along as a one-trick pony, built entirely upon the foundation laid by the Big Three automotive companies Ford, General Motors and Chrysler. And for many decades, business was booming and the Detroiter enjoyed life high on the hog, boasting the highest GDP per capita in the United States while the nation celebrated its own status atop the global GDP per capita leaderboard. All of this would be dramatically diminished beginning in the 1930s, with the Communist Party's Unemployed Councils' organization of the Ford Hunger March in 1932, an orchestrated effort to unionize labor and overthrow capitalism in the United States. 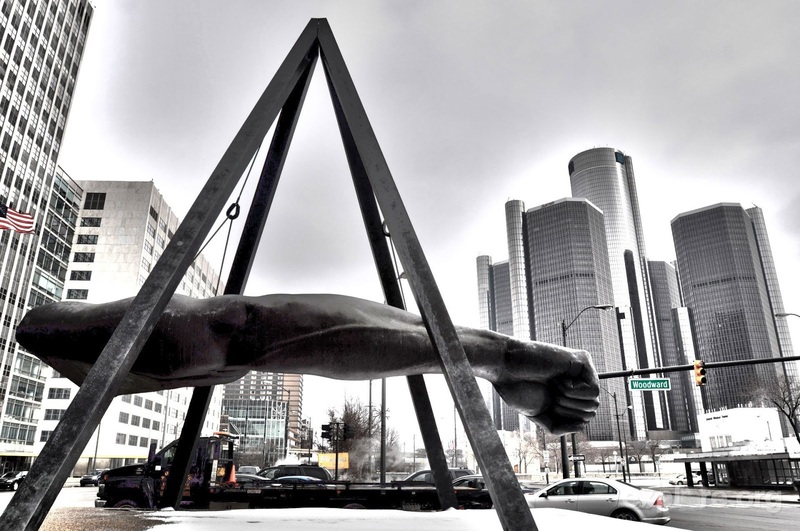 This would combine with a new zeitgeist around the protection of labor, resulting in the introduction of several New Deal-era paradigms that have since demonstrably wreaked havoc on Detroit and American manufacturing. All of this is the outcome of the philosophical disposition leaning on the notion that individuals possess a believed right to employment, even despite the fact that there is no business which will flourish forever and there is absolutely no way to guarantee its continued relevance or profitability. Notwithstanding this grim reality of life, in a world of scarce time and resources, laborers rallied around the cause of seeking revenge against the man who hired them and, in response to slowing real demand, slashed wages and reduced the size of Ford Motor Company's workforce to accommodate the shift of that demand. "Ideologically-driven opposition to common-sense legislation like the Good Jobs for Michigan package stunts not just job creation, but the state’s population growth as well." Now, population growth or any influx of immigration fails to, in and of itself, automatically yield any positive benefit to the state's residents. Only when combined with complete independence and a contributive spirit will this prove to be true. In the case of the proposed legislation in Michigan, neither business subsidies nor the myriad economic development incentives served through any dimension of government have proven successful in any manner beyond facilitating waste or artificially subsidizing the hiring of large cap firms, to the benefit of their balance sheets, while depriving smaller businesses of those potential hires and effectively reassigning the tax burden to firms with less clout and narrower networks. Of course, all schemes of taxation are regressive, but the specific distribution of tax credits wildly distorts the pure value of labor and essentially enables the government to select winners and losers in a contrived zero-sum game. Michigan and the city of Detroit would instead handsomely benefit from a test run of an elimination of the minimum wage law, statewide and citywide moratoriums on income tax, and a complete overhaul of the nation-leading property and utility taxes in the city. This would be part of the prescription for a return to real and sustainable prosperity for a city and state that once set the standard for the rest of the world. Many students of history, whether casual or professional, will surely claim to have an understanding of the causes of the greatest depression in American history. Plainly, they would be lying to themselves. What eludes most surveyors of the crash is the fact that government expenditures actually increased dramatically following the crash of 1929, when President Herbert Hoover increased the federal budget from $3.1 billion to $4.7 billion in 1932. What’s more, Hoover actually inherited a sizable budget surplus, only to transform it into a deficit of $2.7 billion — the third-largest budget deficit in United States history. This meant an increase of the federal government’s share of the whole economy, which constituted a mere 3.4% of gross domestic product beforehand, only to increase to 8% of GDP during the Hoover administration. GDP is the principal metric by which governments assess their nation’s overall economic health: it is the sum of consumer spending, investment, government expenditures and net exports. Of course, this metric became an essential tool for governments to justify not only the efficacy of government spending — which occurs only through the expropriation of capital from producers and at the expense of otherwise viable investments — but also the capacity of governments to take on debt against their anticipated future revenues. So here we have a flawed metric for the birds-eye evaluation of economic wellbeing and thus a failed philosophical attitude toward the appropriate means to resolving economic disrepair. Now, the disrepair of an economy proves always an excellent tool for the wielders of government policy. You see, these are the principal agents of theft who must necessarily convince the public to plunder itself into oblivion, while doing it quasi-democratically. So the government — the institution that shall never let any crisis or disaster go to waste — is always inclined to propose a myriad of tax-sponsored, government-centric solutions to a problem it ill-understands. These are projects typically fueled by sound intentions but untested and impractical methods. So in the aftermath of the crash of ’29, the United States would see the introduction of a protectionist tariff (known as the Smoot-Hawley Tariff) in 1930, the first federal minimum wage (or prevailing wage) legislation (known as the Davis-Bacon Act) of 1931, the later union-serving Wagner Act of 1935, the economically expensive Fair Labor Standards Act of 1938, the National Recovery Administration of 1933, the unsustainable Ponzi scheme (known as the Social Security Act) in 1935, make-work job creation efforts (like the Civil Works Administration and the Tennessee Valley Authority) in 1933, the moral hazard-inducing 1933 Banking Act (which established the Federal Deposit Insurance Corporation), government-sponsored enterprise Fannie Mae (in 1938, which introduced the federal government to the secondary mortgage market), and the 1934 Federal Housing Administration (whose principal objective thus became the introduction of homeownership as the American dream). This would later combine with easy monetary policy, low interest rates, induced tax-sheltering through homeownership, and securitized mortgages (or mortgage-backed securities) bought up by federally-ensured Fannie Mae and (the later introduced GSE partner) Freddie Mac to spark the nationwide disaster later known as the housing crisis. So in pursuit of well-intentioned public policy, Hoover and Roosevelt inadvertently extended the post-’29 market correction by preventing a market reallocation of resources; by imposing artificial price floors on the costs of labor and unintentionally limiting the free exercise of labor and employment; by preventing an equilibrium of exchange with international producers with comparative advantage; by then driving up the prices of goods and commodities by artificially increasing the price of otherwise more affordable goods; and worst of all, all of this set the precedent for future generations’ acceptance of the role of government, the nature of wealth creation and intelligent design, and the believed role of government in addressing market maladies which are appropriate from time to time to purge the markets of ill-advised investments and speculation. So the administrations in charge have perpetually sold to the public the fantastical notions of easy fixes through stimulative monetary policies and job creation. The unenlightened majority might accept this narrative, but the shrewd economist will see right through it. As it turns out, as badly as the modern American wants to believe that there is an easy fix — or a way to wash our hands of the previous bouts of irrational exuberance — there plainly is not. Americans speculated heavily on dot-coms when lower interest rates and unchecked FDIC insurance implicitly encouraged investors hungry for returns to dismiss value, profits, risk and dividends to simply pursue growth and stock price appreciation. As these companies continued to fail to post profits and buyers became sellers, the information technology bubble popped and left the federal government with a mess that they would hastily translate into the next government initiative: engineering the greatest wealth effect in American history through the subsidization of the so-called American dream, homeownership. Unfortunately, in pursuit of this fun-filled escapade of euphoric proportions, buyers forgot that home prices are a function of rents. Economists neglected to remember that homes don’t actually produce any workable wealth, that they cannot be the principal revenue generator for an entire economy. Unfortunately, all of this eluded the pundits and laymen alike. Too many people were mesmerized by the illusory prospect of riches to remember the pragmatics. And anyone who suggested the opposite was relegated to the rank of buzzkill or pessimist. When I characterize taxes as regressive, I mean to say that they redistribute purchasing power in ways that eliminate the value-add cycle. In the voluntary exchange markets, where two or more parties voluntarily transact because they perceive value advantage, there is an assumed value-add in the exchange. This means that no value of the unit of account has diminished across the trade. In time, these trades coalesce to improve the overall value of the unit of account. As we individually pursue our own respective ends, we find that we benefit from economies of scale due to overlapping basic or sophisticated wants and from unwittingly promoting a wholistic set of values, both physical and temporal, which are useful to a great many or to a select few who have also perpetuated this cycle. In a global marketplace, this is less conspicuous, as that unit of account can be manipulated in ways that nominally enrich some balance sheets and embolden specific temporal demands at the relatively unseen expense of the unknown, oftentimes advancing the present at the expense of the viable future. This is demonstrably true in the cash transference between producers who accrue the wealth through voluntary exchange and consumers who receive it through the dependency systems. Direct taxes have been determined the most "regressive" not merely in economic terms but manifestly by Constitutional standards. The US Constitution expressly states in Article 1, Section 9, that all taxes are to be apportioned among the states. Of course, this was not to curtail the power of the local and state governments (see Bill of Rights), but this sentiment clearly implies that federal income taxes, capital gains taxes, and the several withholding taxes are unconstitutional. The historically-ambivalent Supreme Court actually ruled this way in 1896 in Pollock v. Farmers' Loan & Trust Company, yet yielded to the passage of the 16th Amendment in 1913, another bit of history shrouded in ambiguity. In the case of Detroit, where unemployment is consistently more than double the national and state averages, the number of residents on the Supplemental Nutrition Assistance Program, otherwise known as SNAP or food stamps, has dramatically increased over the past several decades. Today, nearly 40% of Detroit households receive assistance in the form of food stamps, while in total 27% of the population of Wayne County receives these benefits. This means that roughly 500,000 people in Wayne County alone rely on food stamps every month. Meanwhile, housing subsidies, Supplemental Security Income, general assistance, and easily-attainable SSDI benefits, among the longer menu of available dependency options, combine with a functional illiteracy rate of roughly 50% to partly explain how Detroit has fallen from its great heights as a manufacturing giant to become the shining exemplar of the end game of well-intentioned policymaking.